Solution: The system utilizes 8.9KW PV panel to power a 5.5KW AC submersible pump with a Solartech 7.5KW solar pump inverter for control and conversion. 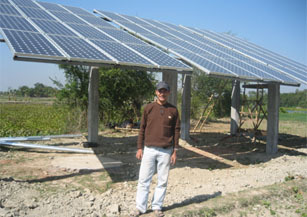 The solar pump draws water from 10 meters underground, and water flow reaches 800-1000m3 per day. Economy Benefit: The system generates 16020 kWh of power every year. During its 25-year lifespan, the solar pump system will save coal 150.6 tons; reduce carbon emission 66.3 tons, sulfur dioxide3 tons, dust 2.3 tons and lime ash 39.2 tons.